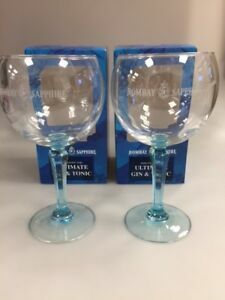 Details about Bombay Sapphire Balloon Glasses. Boxed. 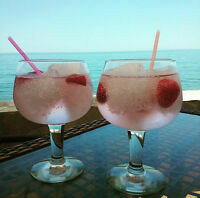 Bar Gin Glass. x 2 . party time. Bombay Sapphire Balloon Glasses. Boxed. Bar Gin Glass. x 2 . party time. There are only two problems I can see with these glasses. You do them justice, you have to drink doubles, and you get through shedloads of ice cubes! Strangely enough, we can cope with both of these problems as we have had years of training :o) For reference, that is a pint glass in the photo!!! 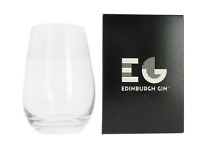 Great stylish glasses, love them and am sharing them with a "gin addict"
The glasses are lovely. The only problem is I bought them for a gift and on the boxes it has in large print ‘Free Glasses’. Good glasses at a good price, not as thin as another I had bought but got two for the price of that one so can’t complain.